Read through the obituaries published today on journaltimes.com. Racine, April 11, Draeger-Langendorf Funeral Home and Crematory, Mount Pleasant. Racine, April 11, Ridgewood Care Center, Draeger-Langendorf Funeral Home & Crematory, Mount Pleasant. Racine, April 12, at St. Monica’s Senior Living, Maresh-Meredith and Acklam Funeral Home, Racine. Racine, April 11, at St. Monica’s Memory Care, Purath-Strand Funeral Home & Crematory, Racine. Racine, April 11, at The Villas at Lincoln Park, Maresh-Meredith & Acklam Funeral Home, Racine. I was born in Racine, Wisc. November 16, 1923, to Marie and Edgar Johnson and preceded in death by my husband, Joseph Ketarkus, Sr., son Joseph Ketarkus, Jr., and brothers Dan and Bob. I was a Catholic my entire life. I graduated from Park High School in 1942 and attended class reunions for sixty-five years. I married Joe Ketarkus in 1946.In the 1950s you didn’t think about having kids; you just did. After having three children I finished night school secretarial training courses and in 1964 returned to work outside the home. Working my way up from payroll clerk to career executive secretary fueled and fulfilled my sharp mind. I was fortunate to work in offices for people of integrity, men who appreciated my proficient office skills and respected my contributions. After my retirement, in 1987, my former boss called me each Secretary’s Day until 2007. I kept my hands busy for decades by practicing creativity sewing, knitting and cooking. I also enjoyed playing Bridge and Schafskopf. Like many of my generation I lived frugally and carefully. While facing major roadblocks like we all do, I was grateful when life’s simple moments caught and redirected my attention and helped ground my active mind. I was glad to provide a sounding board for others tackling their own challenges. Survived by my son, Paul Ketarkus (Sheri), U.S; daughter, Mary Brown (Tom), Geneva, IL; daughter-in-law Karin Ketarkus (Madison, WI); two grandsons, Joseph III and Christopher, twelve great-grandchildren, cousin, nieces and nephew and friends. Hey, I pretty much outlived everyone I knew. Strong wit and strong mind. And all that walking. On behalf of myself and family, heartfelt thanks to: niece Cecilia Johnson for her positivity, niece Cathy Stanek for our talks, Ray Johnson for his kindness and son-in-law, Tom Brown for the solid respect he always showed me. I wish to acknowledge the respectful care shown to me as a resident of St. Monica’s Senior Living. Queen-size gratitude to amazing friends Joanne McSweeney and husband Mike for their pure, unconditional love and hours of help. My favorite quotation, “Well done, good and faithful servant.” Matthew 25:23. Funeral services will be held on Wednesday, April 17, 2019 at St. John Nepomuk Catholic Church, 1904 Green St., Racine, WI. Visitation will begin at 10 AM, by Mass at 11 AM. Private interment at Holy Cross Cemetery, Hwy. 32. LAKE BLUFF, IL—Edward (Bucky) Hanson, 88, formerly of Racine, passed away at Lake Forest Hospital in Lake Forest, IL on Monday April 8, 2019. Funeral services will be held at Holy Communion Lutheran Church 2000 W. 6th St. on Monday April 15, 2019 at 11 a.m. with Rev. Dana Hanson officiating. There will be a visitation at the Sturino Funeral Home on Sunday, April 14, 2019 from 2 p.m. until 5 p.m. and at the church on Monday from 10 a.m. until time of service. Memorials to the American Cancer Society, Special Olympics, or the Alzheimer’s Association have been suggested by the family. Naomi C. Schleper, died at Legacy Gardens in Iowa City, Iowa on April 6, 2019, not long after her 93rd birthday. Her family will greet friends Saturday, April 13, from 1—4 pm, at the Hob Nob Supper Club, 277 Sheridan Road in Racine. Lensing Funeral & Cremation Service in Iowa City, Iowa is handling arrangements. RACINE—Crescencio E. Carbajal, known to most as “Chencho” or “Apa”,85, was surrounded by his loving family when he passed away at Ascension-All Saints on Wednesday, April 10, 2019. He was born in Kyle, TX on April 19, 1933 the son of the late Cirilo and Josefa (Elizondo) Carbajal. Mr. Carbajal served his country with the U.S. Army during the Korean War. On October 29, 1955, in Immaculate Conception Catholic Church, Blytheville, AR, he was united in marriage to Maria Guadalupe Cantu. Mr. Carbajal had been employed by the J.I. Case Co. for over 34 years retiring in November of 1991. He was a member of St. Lucy Catholic Church, and the Case 20 Year Club. He was passionate about gardening and was especially proud of the fact that he had the greenest lawn on the block. He excelled at word searches and enjoyed watching the birds in his yard. Mr. Carbajal deeply loved his family and cherished being with his children, grandchildren, and great grandchildren. Surviving is his loving wife of nearly 64 years, Maria; their children, David (Annette) Carbajal, Diana Carbajal, all of Racine, Irma (Mark) Servais, of Menomonee Falls, WI, and Sylvia (Jason) Rugh, of Racine and grandchildren, Melissa Carbajal, Melinda (Willie) Vaughn, Timothy Olsen, Richard Carbajal, Phillip (Christina) Jardina, Julia (Emilio) Damian, Dena (Dante) Galati, Jacob Olsen, Patti Jardina (Cody Bush), Tony Jardina, Horatio Servais, and Lucas Servais, and great-grandchildren, Peyton, Samuel, and Ethan Meeks, Hailey and Damian Vaughn, Cheyenne Olsen, Jovani Amaya, Eric, Isaiah, and Liliana Carbajal, Mason Jardina, Mario, Emilio, Melanie, Santino, and Manolo Damian, Mariana Porcaro and Danae Galati, his “other daughter” Jean Carbajal. Also, his siblings, Paul (Melia) Carbajal, Ramiro Martinez, Isidro (Lydia) Carbajal, Cutberto (Linda) Carbajal, Tomasa Garcia, Aurora Carbajal, Santos (Cindy) Carbajal, Cirilo (Melody) Carbajal, Maria (Modesto) Oviedo, Jesus (Jodi) Carbajal; sister-in-law Elodia Carbajal. In addition to his parents, Mr. Carbajal was preceded in death by his son, Mario and grandson, Christopher Eric, brothers and sisters: Fernando Carbajal, Juan Carbajal, Pedro Carbajal, Sixta Castro, Nieves Carbajal and nephew, Daniel M. Carbajal. His Mass of Christian Burial will be held at St. Lucy Catholic Church, 3101 Drexel Ave., on Monday, April 15th, with Rev. Nabil Mourannes officiating. Visitation will be in the funeral home on Sunday, from 3:00 p.m. until 6:00 p.m. and in the church on Monday from 10:00 a.m. until the time of the Mass. Burial, with full military honors, will follow in Calvary Cemetery. We would like to thank Ascension—All Saints, especially the ICU, the Inpatient Rehabilitation Team and Aurora – St. Lukes Medical Center Cardiovascular Services. Your loving and professional care was greatly appreciated. 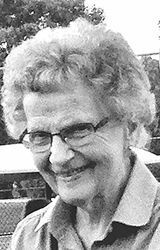 RACINE – Lois Jean (nee: Joslin) O’Connor, age 85, passed away peacefully at Ridgewood Care Center early Thursday morning, April 11, 2019. Lois was born in Rhinelander, WI on April 12, 1933 to the late Oren and Eileen (nee: Barber) Joslin. She was a graduate of William Horlick High School. Lois was united in marriage with Leonard B. “Red” O’Connor, who preceded her in death on March 25, 1995. Among her interests, Lois enjoyed shopping, gardening, and gathering wood to burn in her fireplace. Above all, she loved spending time with her entire family. They were her everything! Surviving are children, Jacqueline O’Conner, Robert (Debra) O’Connor, Richard (Leann) O’Connor and Daniel (Rene) O’Connor; grandchildren, Kevin Curty; Staci, Jennifer, Joseph (Brittany), John Henry, Samuel and Megan O’Connor; great-grandchildren, Avereigh and Logan O’Connor; sister, Janet Gohde; sister-in-law, Evelyn Joslin; brothers-in-law, Edward (Bonnie), Samuel (Barbara), Robert (Evelyn) and David (Karen) O’Connor; nieces, nephews, other relatives and friends. Lois was preceded in death by her father, Oren Joslin; mother, Eileen Joslin-Hartgen; husband, Red; beloved son, Patrick O’Connor; brother, Arthur Joslin; brother-in-law, Don Gohde; sister-in-law, Sandra (Dale) Rogers; and by Red’s parents, Leonard and Emily (nee: Heinen) O’Connor. Services celebrating Lois’s life will be held in Draeger-Langendorf Funeral Home on Tuesday, April 16, 2019 at 1:00 pm. Interment will take place in West Lawn Memorial Park. A memorial luncheon will follow. Visitation will be in the funeral home on Tuesday from 11:00 am– 1:00 pm. A heartfelt note of thanks to the staffs of Ridgewood Care Center and Hospice Alliance for the compassionate care & support given in Lois’s time of need. May God bless all of you! RACINE—Barbara B. Mattner, age 72, passed away Saturday, April 6, 2019 at Bay Harbor. She was born in South Milwaukee, August 20, 1946, daughter of the late Dolores (Nee: Beck) and Henry Koller Jr.
She was a graduate of South Milwaukee High School. Furthering her education she graduated from Columbia Nursing School as a Registered Nurse. Her nursing career spanned forty years until her retirement in 2007. Barbara was employed by St. Mary’s Medical Center, Racine Medical Clinic, and All Saints Hospital. She also volunteered with Hospice Alliance and NAMI. On June 3, 1994 at DeKoven Chapel she was united in marriage to Robert O. Mattner. She was a former member of St. Paul the Apostle Catholic Church. In her younger years she marched with the Mariners Drum & Bugle Corps. Always the life of the party, Barbara also enjoyed bowling, gambling and was a faithful Packer, Bucks and Brewer fan. Above all she was devoted to and cherished time spent with her family. She will be dearly missed by her loving husband, Bob; her children, Scott (Diane) Ryan of Racine, Jason (Tracy) Ryan of Pewaukee; stepdaughters, Tamara (Tom) Sugent, Cheryl (Dennis) Rosquist; grandchildren, Avery and Peyton Ryan, Joshua and Jordan Wolfe, Corey (Alaina) Kroes, Erin (Ricky) Lee, Jodie Sugent, Katie (Andy) Madisen, Alex (Kaitlin) Sugent; great-grandchildren, Luke, Ben, Cameron, Charlie, Henry, and McKenzie; sister-in-law and brother-in-law, Phyllis (Dale) Crawford; special nieces, Jennifer Koller-Evans (Andy), Kimberly Koller; great nephews, March and Thomas; 3 dear cousins, David (Joanne) Koller, Joanne (Gus) Ricca, Weezie (Bill) McClarron; other relatives and many dear friends. In addition to her parents she was preceded in death by her brother, Henry Koller. Funeral services including a Nightingale service will be held Sunday, April 14, 2019, 5:00 pm at the funeral home with Rev. Mark Jones officiating. Relatives and friends may meet with the family Sunday at the funeral home from 3:00 pm until time of service at 5:00 pm. In lieu of Flowers, memorials to NAMI have been suggested. Please join the family for a gathering celebrating Barbara’s life immediately following the service. A special thank you to the staff at Bay Harbor, especially Angel and to Amy at The Woods of Caledonia for their loving and compassionate care. RACINE—Leona Phyllis (nee: Karniewski) Marino, 86, passed away on Wednesday, April 10, 2019 at Clement Health Care Center in Greenfield. Mass of Christian Burial will be held at St. Louis Catholic Church, 13207 County Road G, Caledonia, on Saturday, April 13, 2019 at 11 a.m. with Rev. Yamid Blanco officiating. Visitation will take place at the church on Saturday from 9 a.m. until mass time. Following mass Leona will be laid to rest at St. Louis Cemetery. RACINE—Crescencio E. Carbajal, 85, was surrounded by his loving family when he passed away at Ascension-All Saints on Wednesday, April 10, 2019. His Mass of Christian Burial will be held in St. Lucy Catholic Church, 3101 Drexel Ave., on Monday, April 15th, with Rev. Nabil Mourannes officiating. Visitation will be in the funeral home on Sunday, from 3 p.m. until 6 p.m. and in the church on Monday from 10 a.m. until the time of the Mass. Burial, with full military honors, will follow in Calvary Cemetery. Please see Saturday’s paper, or our website for more information. RACINE—Mary Lou Vandenburg, age 80, passed away Sunday, April 7, 2019 at her residence. Funeral services will be held Saturday, April 13, 2019, 10 a.m. at Plymouth Congregational Church, 1143 College Avenue, with Rev. Chris Bryan officiating. Interment will follow at Green Ridge Cemetery, Kenosha. Relatives and friends may meet with the family Saturday at the church from 9 a.m. until time of service at 10 a.m. Memorials to Plymouth Congregational Church or to any animal organization of one’s choice have been suggested. She was born in Milwaukee on September 29, 1932, the daughter of the late Leon and Sally (Drywieski) Karniewski. On September 11, 1954, Leona was united in marriage to John Marino. She was a member of St. Louis Parish for 60 years. Leona enjoyed spending time with family, Disney World, Christmas, baking, sewing and gardening. She was an amazing woman who will be forever missed. Leona will be missed by her husband, John; children, Debbie (David) Scafidi, Annie (David) Stangas, Cindi Marino, Annette (Ken) Noll, Mary Jo (John) Schimanski, John (Renee) Marino, Kim (Jack) Bianchi, and Jodi (Dan) Nelsen. She is further survived by 17 grandchildren, and seven great grandchildren, and one sister, Donna. Leona is also survived by nieces, nephews, other relatives and many dear friends. She was preceded in death by her sisters, Theresa, Jeanette, Adeline, Bernadette, and one brother, Leroy. MT. PLEASANT—Shirley A. Zenner, 92, passed away unexpectedly and peacefully on Monday April 8, 2019. Funeral services will be held at 11 a.m. at Faith Lutheran Church in Sturtevant on Saturday morning April 13, 2019 with Rev. Dana Loney officiating. Relatives and friends may visit with the family at the church from 9 a.m. until time of the service. Interment will be at West Lawn Memorial Park. In lieu of flowers, the family requests that donations be made to the Faith Lutheran Church-LCMS, 8500 Durand Avenue, Sturtevant, WI 53177. Bucky was born on July 21, 1930 in Racine to Steven and Katherine (Jensen) Hanson. He was united in marriage to Nancy (Sorenson) Hanson at the home of her parents (Harry and Emma Sorenson) on July 22, 1950. Bucky was a 1948 graduate of Washington Park High School. He remained a member of Holy Communion Lutheran Church even after having moved to Minnesota with Nancy beginning in May of 2013 and living outside of Racine until his passing. Bucky served the Racine community as a Funeral Director and owner of the Hanson Funeral Home for over 45 years. He began working in the family business with his father Steve Hanson in 1950 and retired as owner in 1995. He was member of the Racine Rotary Club and a Paul Harris Fellow. He and Nancy enjoyed their summer homes, first, on Bohner’s Lake in Burlington, WI and later in Three Lakes, WI on Big Stone Lake following his retirement. They travelled extensively in Germany, Italy, and to many islands in the Caribbean. The summer homes along with the hobbies and interests Bucky had were simply vehicles to strengthen and celebrate the relationships with family and friends that were the central focus of Bucky’s life. He not only loved to share stories but was instrumental in creating them for his five (5) “boys”, their families, and the extraordinary group of lifelong friends that were so important to he and Nancy. He continued to touch the lives of others with his humor, his willingness to help, and his genuine interest in the well-being of the many wonderful people he met in Ft. Lauderdale, FL, Lakeville, MN; Eden Prairie, MN, Edina, MN, and since June of 2019, in Lake Bluff, IL. He is survived by his sons Dr. David and Shari Hanson of Libertyville, IL; Rev. Dana and Nancy Hanson of Winnetka, CA; Jon Hanson of Milwaukee; and Andrew and Peggy Hanson of Minnetonka, MN; his grandchildren (and spouses) Robert and Kristen Hanson, Laura Hanson and Greg Larson, Kristina and Sean Herman, Elizabeth and Nate Mcintosh, Gregory and Becca Hanson, David Hanson, Avi and Sarah Hanson, and Emma Hanson; Great-Grandchildren, Kaylee Herman, Elise Herman, and three future great-grandchildren due within the next three months. Also surviving Bucky are his sister Jackie Dodson of LaGrange, IL and his brother Rev. William (Billy) Hanson of Florida. Bucky was preceded in death by the love of his life for 64 years of marriage, wife Nancy in June of 2015 and their cherished son Steve Hanson in December of 2016. Funeral services will be held at Holy Communion Lutheran Church 2000 W. 6th St. on Monday April 15, 2019 at 11 a.m. with Rev. Dana Hanson officiating. There will be a visitation at the Sturino Funeral Home on Sunday, April 14, 2019 from 2 p.m. until 5 p.m. and at the church on Monday from 10 a.m. until time of service. MOUNT PLEASANT – Raymond E. Stevens, 92, passed away after a long illness at Hospice Alliance – Hospice House on Monday, April 8, 2019. He was born in Madison on September 8, 1926, the son of the late Clyde and Helen (nee: Wood) Stevens. Ray proudly served his nation with the U.S. Navy during World War II. After his military service Ray worked as a sign and billboard painter. He would eventually work for the US Postal Service for over 30 years. He retired in 1988. Ray was a gentle and kind man. He enjoyed being on his computer, attending functions at Roma Lodge and being in the company of his family. He is survived by his loving wife, Mary (nee: Valente) Stevens of Mount Pleasant; his daughters and sons, Roxanne (Tom) Starr of Cedarburg, Janet Stevens, Tom (Mimi) Stevens, Patty Stevens Bloom and David (Wei-Han) Stevens all of Madison; 14 grandchildren; 18 great grandchildren and one great-great grandchild; as well as many nieces, nephews and other relatives. He was also preceded in death by his daughter, Jean Stevens; his son, Michael (Nancy) Stevens; his brothers, Arnie and Eugene Stevens; his sisters, Pearl and Rose Johnson; as well as many sisters-in-laws and brothers-in-law. Family and friends are invited to meet in the Draeger-Langendorf Funeral Home and Crematory on Saturday, April 13, 2019 for a visitation from 10:30 a.m. – 12 p.m. A service celebrating and remembering his life will be held at 12 p.m. His interment with military honors will follow at West Lawn Memorial Park. In lieu of flowers, memorials have been suggested to one’s favorite charity. The Stevens family extends a heartfelt thank you to Dr. DeCheck and his staff for the professional and loving attention Ray received with under their care. RACINE-William “Bill” Darrell Gandee, Jr., 81, passed away at his residence on Wednesday, April 10, 2019. He was born in West Virginia on May 28, 1937 the son of the late William and Opal (nee: Boone) Gandee. He was employed in the shipping department with Racine Steel Castings for many years. Bill is survived by his brothers, Grayson Gandee of Jackson, Ohio, John (Patricia) Gandee of Virginia, and David (Shelia) Gandee of South Carolina, two sisters, Betty Good, and Margaret McCallister both of West Virginia. He is further survived by dear friend and former brother-in-law, Richard (Shirley) Jarvis of Racine, former wife, Nancy Sass and other relatives and friends. A visitation to celebrate Bill’s life will be held at Sturino Funeral Home on Monday, April 15, 2019 from 10 a.m. to 11 a.m. Bill will be laid to rest at West Lawn Memorial Park. We would like to thank everyone who took such wonderful care of Bill; Richard and Shirley Jarvis, Nick and Shonna Royer, and Wheaton Franciscan Hospice.